A story of mine is available now in the July 2017 issue of Mystery Weekly Magazine! And the kind editors of this excellent publication decided to give my story top billing, too. I didn’t know they were going to do that until I saw the cover. As you can imagine, I was/am thrilled verging on insufferable about this. I have been carrying my iPad about with me ever since, showing the cover to friends, family, and total strangers. Anyone who doesn’t see me coming first, in fact, gets the cover right between the eyes. And that is not all! Regular readers of this blaugh may perhaps remember my epic 2015 April A to Z Blogging Challenge, Alas: A Complete Edwardian Murder Mystery Novella. The investigators from that Stirring Tale, Inspector Crowner and Sergeant Mug, star in this adventure, too. 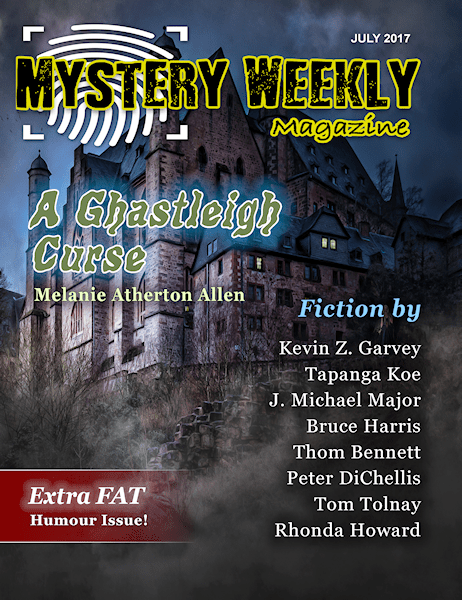 In our feature mystery, a jaded Edwardian Inspector follows a bloody trail through secret passages in “A Gastleigh Curse” by Melanie Atherton Allen. In other words, total excitement! Buy a copy of the issue to find out more! Click here to go the Amazon page! Or Click here to go to the Mystery Weekly website, where you can read samples of the stories and get digital subscriptions and neat stuff like that.